Travel is fun but then again if you are not clearly updated about the activities and proceedings you might end up with a missed flight and such other mishaps. To keep such unfair things at bay, it’s always advised to take up a daily agenda template. The agenda will offer a synopsis of the entire journey, starting from the day of departure to the day of arrival. 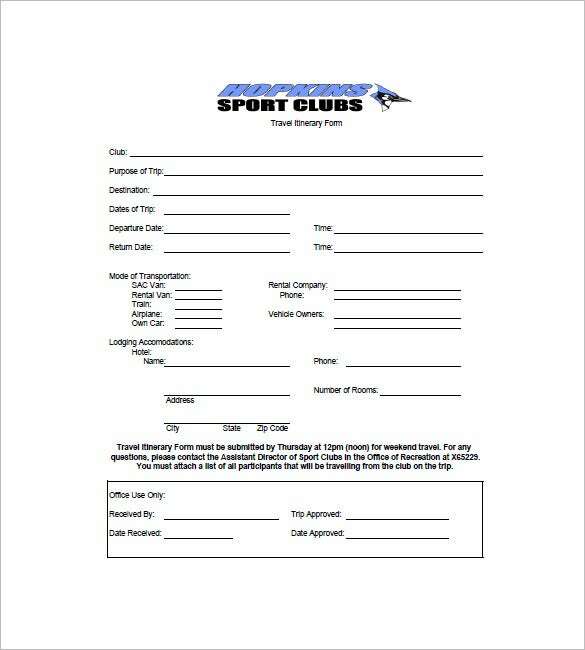 web.jhu.edu | Sample travel agenda form template is a document containing a format of travel agenda for a trip that a sports club is organising. Listing all the details related to the purpose of trip, this document is a purposeful travel agenda in which one can fill up the specifics like departure date and arrival date, the mode of transportation, lodging details, etc. the agenda is generally presented by organising party to the office for their approval. So, one can depend on this document for official use. 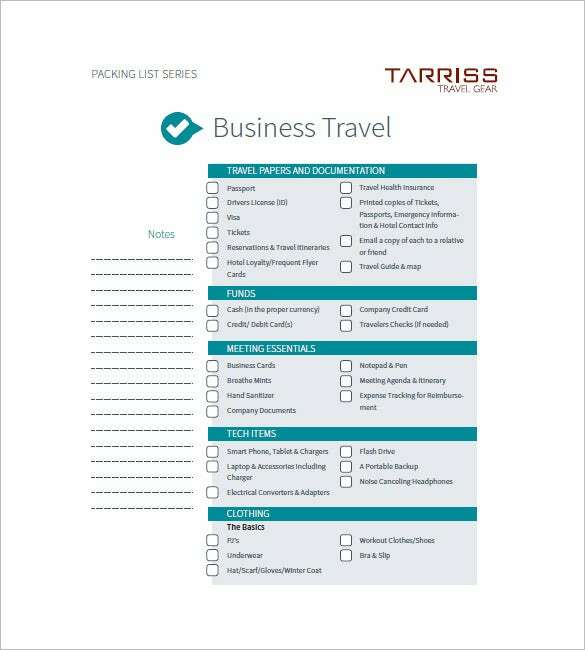 tarrisstravelgear.com | A business trip agenda template is a travel agenda for businesses/ organisations for professional purpose. This document contains the number of items that must be taken with a person if he is on a travel trip. This is why this document lists items like clothes, toiletries, travel papers, cash/paper money that must be taken along for a smooth trip. A user can mark the items from the list which he/she thinks should be taken along. Download this template online for free use in PDF Format. 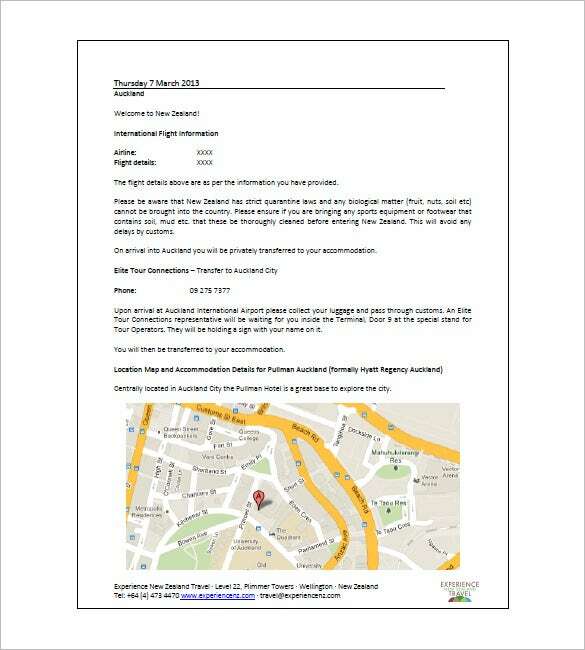 experiencenz.com | A free trip agenda template is a sample of a traveling trip and details related to its conduct. 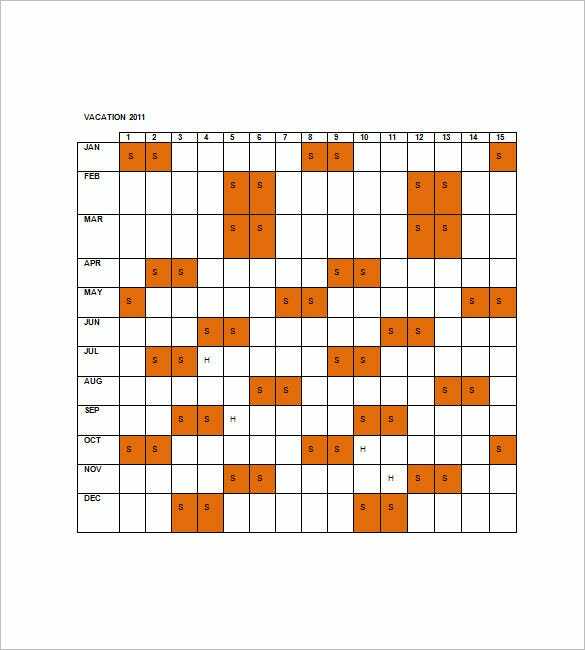 If an organisation/ an institute is planning for a trip for its employees they can refer to this template so as to choose the content that must be part of this document. Including details like the mode of transportation, coach/flight number, the travel itinerary and the attached of map of the destination, this document is all that you want from a trip agenda. 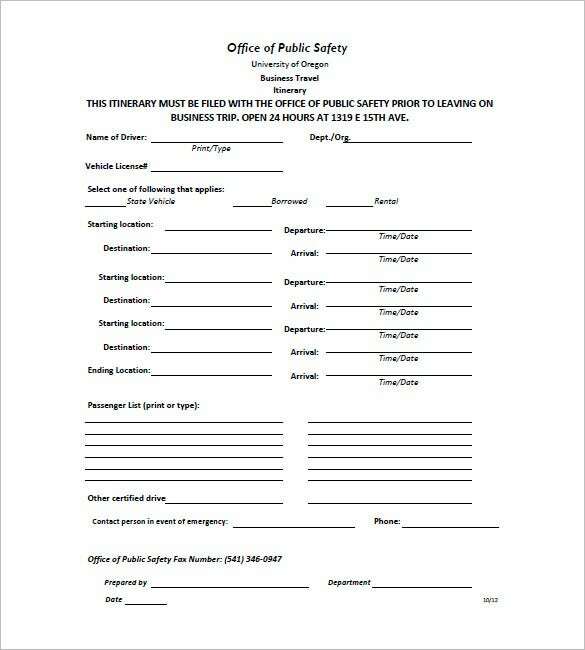 One can avail this document online for free use. A agenda template comes up with complete data on the flight timing, airports, lodging, time of checking in & out, places to cover for sightseeing in sequential order and so on. In short, the agenda will offer a sketch of the vacation at a glance. 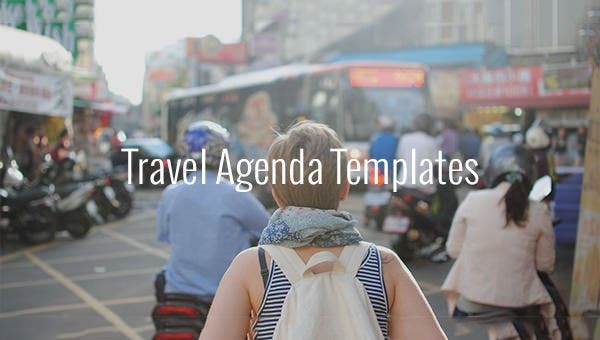 > Why do We Need a Sample Travel Agenda Template? 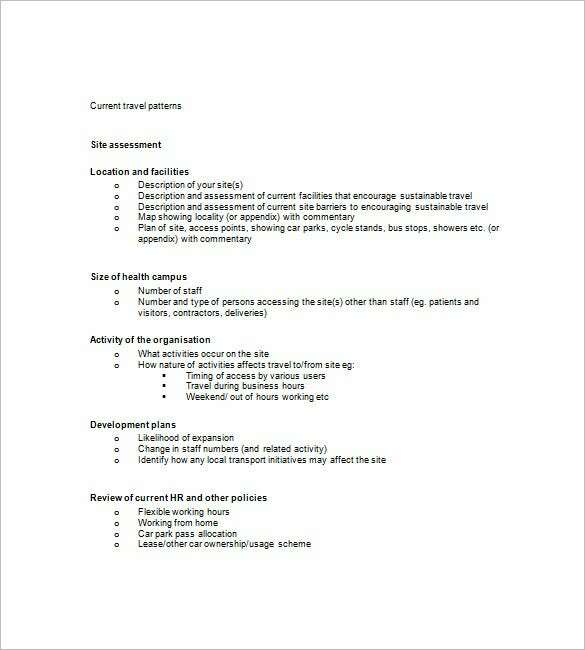 Sample travel agenda template is quite a needful list of templates. This is specifically needed by person, group, unit or organisation which is planning a trip or a visit to some place for leisure or for business purposes. This itinerary containing the reason of trip, the medium of travel, the lodging, number of days of trip and the forthcoming expenses is included in the body of travel agenda. > When do We Need a Sample Travel Agenda Template? Those who are planning a trip may need to take ideas from the various travel agenda templates mentioned in this collection. The various formats included are both simplistic types as well as detailed. So thus, one can choose the file that suits us best. > What are the Benefits of Sample Travel Agenda Templates? The sample travel agenda templates mentioned in this portal are elaborate and detailed, and take good quality check of the content. These varied types of templates give its users freedom of choice. On the top of it, these templates are free of cost so one needs not spent undue money on them. One may seek ideas and in fact can copy the format as it is when planning to compose a travel agenda. This will help us in saving time as well as money, since these read-to-use templates are available for free use. These travel agenda templates helps one in taking ideas for forming the body of content comprising the itinerary of this travel. If you have any DMCA issues on this post, please contact us!